If I ever get into a second marriage, there are so many things I would do differently–starting with the engagement. 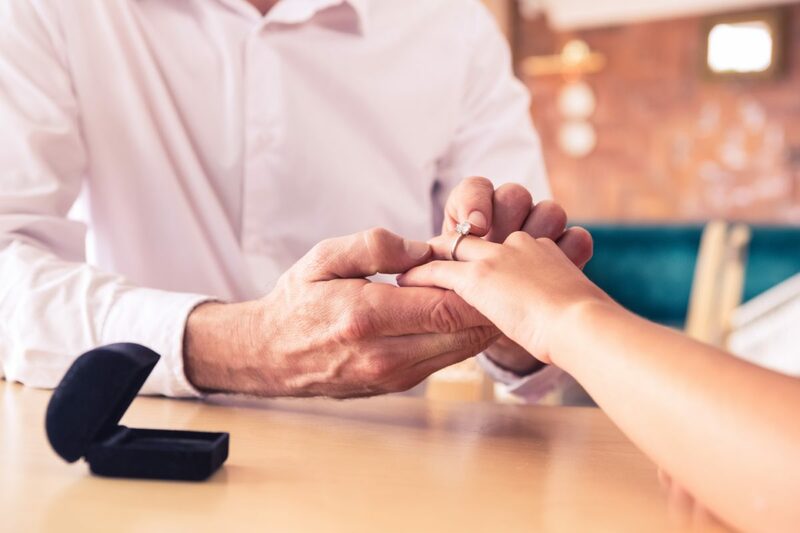 Check out this article I wrote for ESME, offering tips to those getting engaged for a second marriage, on how to increase the odds that the marriage will last forever this time. When I got engaged 16 years ago, I remember it feeling almost fairytale-like, being a girl who had waited for this moment since she was seven. Immediately following my now-ex-husband’s proposal, I made phone calls telling everyone the happy news, stared at my left ring finger for hours at a time, and, of course, started planning the wedding. I’m pretty sure that within 48 hours of being engaged, I had already called a few venues to see if they were available for that next fall. Planning the wedding became a project that was both stressful and fun, and took up most of my nonworking hours. Looking back, I seriously can’t believe I cared so much about all that stuff. Don’t get me wrong: those who attended my wedding will tell you it was a top-notch, classy, gorgeous event with a well-known band, gourmet food, and an unforgettable dessert table. That said, now I realize I missed all the important things someone should be doing when he or she is engaged. So, for those Solo Moms who are engaged to be married, whether for the first time or not, here are some tips based on what I would have done differently. 1. Focus more on the marriage versus the wedding. Forget the flowers and the invites and the rehearsal-dinner details. Being engaged is a happy time that should be spent preparing not only for the wedding weekend but also for your marriage. This is a time to get to know your partner even better than you already do—because believe me, you won’t know him or her fully for at least a decade. Think about the home where the two of you will live. Are there things you could change that he or she would like and appreciate? Are there things your partner dislikes with which you are willing to part? Have you discussed parenting expectations? Is alone time an expectation on either part, and are both of you OK with that? What will your life together be like from day to day? Preparing for a marriage is a lot harder than planning a wedding. It takes looking in the mirror and being honest and realistic with yourself about your future. 3. Have a heart–to–heart with all of your kids. If you think getting married or remarried is a huge life change for you, can you imagine how your kids feel? The best advice I can give is to get everyone prepared for your new marriage by communicating. Ask your kids what questions they have, and answer them honestly and in detail. Tell your kids how you envision your lives moving forward. Maybe some nights will be dedicated just for you and your kids, without your spouse. Maybe explain that you aren’t trying to force them into a new family, but you hope everyone gains extra people to lean and depend on and, hopefully, trust and love. 4. Have a heart–to–heart with your partner. Being engaged is the perfect time for both of you to put all your cards on the table and talk about serious life issues that will now be relevant (if you haven’t done so already). Should the two of you get long-term-care insurance policies? Are you going to change your wills? How are the finances going to work? Will you split the bills? Will you both be OK if the other wants to take his or her kids out without you and yours? Where will you spend holidays? What is going to change? There are countless discussions that need to be had, and many can be difficult, awkward, and sensitive. But once you have them, your relationship will be even more solid because you’ll both be on the same page regarding expectations.